RRC Heritage Group | Not the brightest light in T.O. Not the brightest light in T.O. Unfortunately, the lights that 68-year-old Ilya Desphares turned off were his headlights. 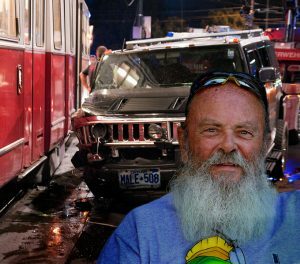 Losing control of his speeding 1993 Hummer in the process, the senior felled three power poles on Old Mill Road before slamming into a TTC streetcar. Fortunately, no one was seriously hurt. But power was knocked out for thousands as hydro crews worked well into the night to repair the damage. 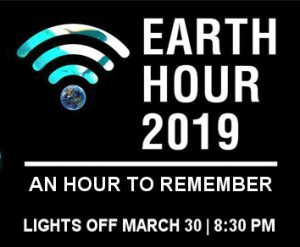 Never have so many lights in Hogtown been switched off for Earth Hour! Desphares now faces charges of dangerous driving, driving while suspended (he lost his license in 2012 for street racing), speeding, driving while under the influence of a radio, and driving without insurance. Talk about giving seniors a bad name! Save the planet? In a Hummer? Lights are off and nobody’s home. This elevator is stuck in the basement. Some village lost its idiot.